Three months after the devastating earthquake, children in Port-au-Prince are now permitted to return to school. For some it means going to tents which have been constructed as temporary schools while new buildings are being erected. It is a positive sign that children can resume a daily routine and see old classmates again, but they still must deal with the fact that many classmates have not come back, due to either being missing or dead. One all-boys school is offering counseling for students to deal with the tragedy. Nearly three months after the earthquake, vivid reminders of death are almost everywhere you look. But nothing symbolizes recovery and the future more than seeing children learning, singing, smiling. The effort to rebuild this nation will take many years. The children we talked with in school today will be the leaders of that effort tomorrow. 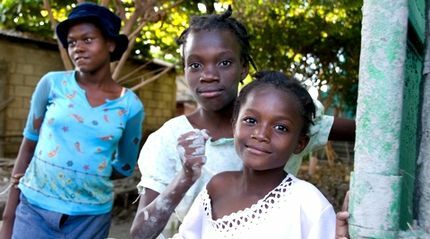 I am glad to see that something good is happening in Haiti! I also hope the international community will be able to pay the teachers their salaries or even part of them! At the moment it looks like they are only doing it out of the goodness of their hearts and have a passion for teaching the next generation! A first step on the return to normalcy. I hope international aid continues and that Haiti can be better than it was before the quake. Let's not abandon them! I'm happy that so many people are donating to Haiti and so much help has gone to them. But it's also important we think long-term. It's not just about food, school, it's about their infrastructure, economy, etc as well. I'm glad things are turning back to normal out there.